Find out what it means to "make disciples of all nations" (Matt. 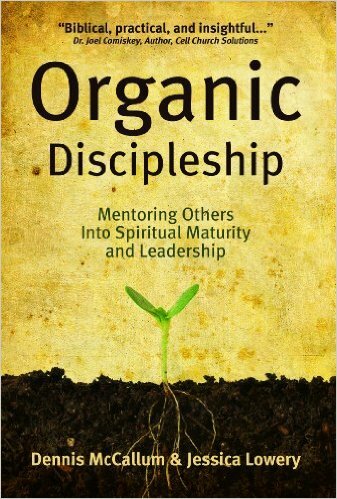 28:18-20) in Dennis McCallum's book, Organic Discipleship! Gary Frieson's book by this title is controversial, and, in our view, extreme. The following points represent a measure of agreement as well as difference. We advance these points for discussion and debate. Many passages cited to support the idea of subjective leading are invalid because they are misinterpreted. Rom. 8:14; Gal. 5:18; Ps. 32:8; Eph. 5:10,17; Rom. 12:2 refer to the revealed, moral will of God. Col. 3:15 refers to peace between believers. Prov. 3:5,6 refers to learning wisdom from the Word. I Jn. 2:27 refers to discerning false prophets. There is no evidence that circumstances are definitive for leading in the New Testament economy (II Cor. 2:12,13 - Paul did not feel compelled to stay in Troas; I Cor. 16:8,9 - even though there were adversaries, Paul stayed on until Pentecost). The decision to either use or pass up an "open door" was based on spiritual expedience. While God can lead through inner feelings, any leading based on feelings can only be tentatively held. Furthermore, where the Word is clear, feelings must be overruled. The proper role of feelings is, in general, to respond to God's will, not to interpret God's will. Whenever possible, guidance from such gifts is subjected to the objective test of scripture (I Cor. 14:29; I Cor. 12:1-3; I Jn. 4:1-3). The quality of life of the gifted person is to be closely scrutinized (Mt. 7:15-20). The content of such guidance in the New Testament tends to relate to the ministry of the church rather than to private, personal interests (see Acts 11:27ff). The "leading of the Holy Spirit" could refer to the Holy Spirit reminding and convicting the believer of God's moral will in specific situations (Jer. 31:33; Heb. 10:16). It could also refer, at times, to direct intuitive verbal communication. Asking for wisdom (James 1:5) - the illumination of the mind to view the situation from the perspective of God's revealed will. Sensitizing the believer to conviction of God's moral will. Reflection on data relevant to the situation. Resolving to do God's moral will (Mt. 26:36-46) and asking for the power to do it. Such revelations are not necessary for life direction or spiritual maturity. They are liable to deception and abuse. Therefore, care should be exercised. Unless a prophet has a proven record to verify his prophecy (including no errors), he cannot expect others to believe him. Which of the following "road-signs" do you consider to be useful in determining God's will for your life? Explain the usefulness and/or limitations of each.